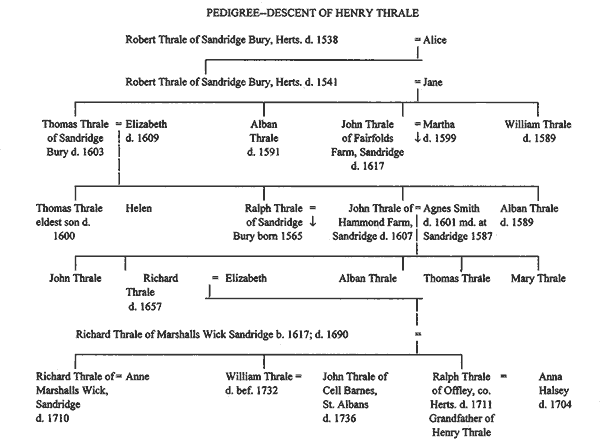 Prior to Richard W Thrale's authoritative chronicles on the history of the Thrale family, the below 1948 article by J.H. Busby was the leading account of the families history. Much has been written, in recent years, about the Thrales of Streatham, of Henry Thrale the friend of Dr. Johnson and his wife Hester Lynch Thrale. In all cases Henry Thrales father is made out to be the son of a poor cottager of Offley, Hertfordshire, who was rescued from a life of poverty through the munificence of his mother's brother, Edmund Halsey. These facts were published by Hester Lynch Thrale, who at all times looked down on her husband's forbears as 'mere cottagers,' whereas Henry Thrale's ancestors were, in fact, yeoman farmers of a long Hertfordshire descent. The name first appears in Bedfordshire, where a William Trayle was M.P. for the County in 1376 and 1381, and two centuries later Michael Thrayle appears as M.P. for the Borough of Bedford in 1541. In the fifteenth century the family was settled near Luton in Bedfordshire, and the name has been perpetuated in the farm Thrales End on the Bedfordshire and Hertfordshire border. A Richard Thrale, perhaps of Thrales End, is recorded in a fifteenth century Court Book of the Manor of Annables Herts1, in connection with one acre of land belonging to Richard Smyth, a copyholder, which Richard Thrale wished to possess. In order to avoid going through the Manorial Court, Richard Thrale had bribed one John Ballard with a pair of hose to arrange the purchase. The sale was completed, but John Ballard, not getting his hose, informed the Lord of what had happened and the land was forfeited. A later Richard Thrale died possessed of Thrales End in 1573 and was succeeded by his son John Thrale, citizen and winter of London, of the Boars Head at Old Fish Street, London2, An earlier John Thrale was Master of the Guild of the Holy Trinity in Luton Church in 1483. (c) John Thralecopyhold lands and tenements called 'Feyrwnlfes,' later known as Fairfolds. (d) William Thrale copyhold lands and tenements called 'Grownwynd, Malewerdecroft and Howberys. Of the children of Robert Thrale the younger, two, Alban and William, died unmarried, William Thrale at the time of his death being possessed of property in St Albans including; the Red Lion Inn 'over against the Crosse' and the Peacock, and his will was witnessed by Stephen Gosson, author of 'Schoole of Abuse' (1579) and who was Vicar of Sandridge 1586-91. John Thrale settled at Fairfolds Farm, Sandridge, which was to continue to be farmed by the Thrale family until the nineteenth century. Thomas Thrale, the eldest son, died in 1603 and as his eldest son Thomas had predeceased him in 1600 leaving four daughters. Sandridge Bury came to his second son Ralph, the first appearance of this name in the Sandridge family. Ralph Thrale's descendants settled at No Mans Land Farm, Sandridge, where they remained till the end of the nineteenth century. Richard Thrale, the eldest, succeeded to Marshalls Wick, died 1710. William Thrale died before 1732, appears as the tenant of Cell Barns in 1700. [leaves much to his family]. The coat of arms used by Henry Thrale, viz, Paly of ten Or and Gules, with the Crest, Out of a Ducal Coronet an oak tree vert, is the same as appears on a monument in St Albans Cathedral. 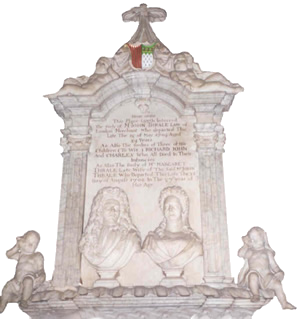 This monument, consisting of the busts of a man and a woman, is to John Thrale of London, merchant, and his wife Margaret. This John Thrale who died 15 May 1704, aged 54, had succeeded to Fairfolds Farm Sandridge, on the death of his uncle, John Thrale, in 1662. He married in 1673 Margaret Chaplin of the same family as Sir Francis Chaplin, Lord Mayor of London in 1677, and appears in the Livery as a citizen and Brewer in 1696. His farm at Fairfolds was farmed by his brother, Thomas Thrale, and in his will9 he left the farm; to his wife and thence to the issue of his daughters Margaret and Sarah and failing; such issue to the Rector of the Cathedral Church and other Trustees in trust for the rents of the farm to be spent on the repair of the Cathedral. Fairfolds, however, was to remain the possession of the descendants of John Thrale until sold to their kinsman, Thomas Thrale, in 1765. The same arms were used by a Sussex family of the same name and they appear or the monument to Thomas Thrale (d. 1658) in Rotherfield Church, Sussex. A similar coat was used by John Threele of Arundel; who died in 1465 and was Marshall of the Household to William, Earl of Arundel, and in this case the coat was : Paly of ten, Or and Gules10. It should be noted that no Thrale arms are recorded in any of the Visitations of Hertfordshire. 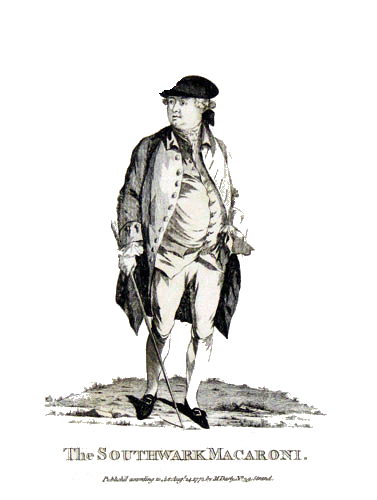 The Gentleman's Magazine records the deaths of two later Sandridge Thrales; Mr. William Thrale of Chiswick, brewer, who died 13 March 1793, was a son of Ralph Thrale of No Man's Land Farm, Sandridge, who died in 1755, and 'Mr. Thrale, pastry cook, opposite the Admiralty Office, Charing Cross, who died 5 June 1790, is the John South Thrale tomb still remains in Sandridge Churchyard. 1. [HALS]9 Muniment Room Smyth Documents No. 41650. 3. Chancery Proceedings C.I. 1154 & C.I. 1055. 4. Arch. St Albans Reg. Kynsbury fol. 18. 5. Arch. St Albans Reg. Ewer fol. 27 (Richard Thrale d 1541) and Reg. Clapton fo. 132 (William Thrale d. 1589. 6. HALS Muniment Room, Gorhambury Document Vo. 4, No. C 61A. 7. Arch. St Albans, reg. 1718-43, folio 303. 8. Arch. St Albans Reg. Eling. fol. 42. 9. Will proved P.C.C. 1 June 1704. 10. Harlean Soc. Publications, Visitation of Sussex. 11. 13 November 1948, p. 495-498, Busby J.H.